Kevin Durant is an NBA All-Star, NBA scoring champ and team captain of the Oklahoma City Thunder. To give a nod to Kevin Durant’s roots near the U.S. capital, the Nike KD VI 6 DC is unveiled. The colorway is patriotic as one might imagine, donning stars and stripes along with a red, white and blue color palette. 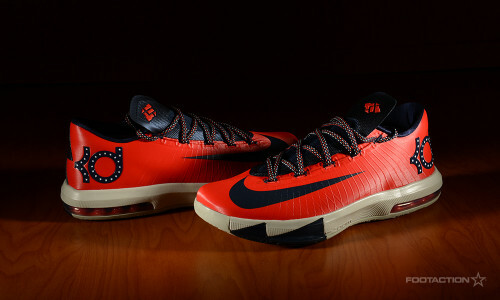 The laces sport the same theme, while the sneaker is wrapped up and completed with a special version of the “KD” logo. The Nike KD VI 6 “DC” is only available for a very limited amount of time. Available online only on tomorrow. Print article This entry was posted by hhcblog on February 5, 2014 at 12:19 pm, and is filed under Footwear. Follow any responses to this post through RSS 2.0. You can leave a response or trackback from your own site.